NOVEMBER 3, 2004 would be remembered in the history books as a day when the Christian community in Singapore gathered at St Andrew’s Cathedral to commemorate 200 years of the Bible Society movement. From the different churches, traditions, backgrounds, and even musical styles, Christian leaders, representatives and choirs came together in one united display of solidarity to reflect on the manner in which God’s Word has impacted the world. The weather was overcast for most of the day, with the rain stopping just in time for staff and volunteers from The Bible Society of Singapore to start preparing for the service. As time passed into the evening, more volunteers showed up to lend a hand, the choirs started to arrive and commenced to warm up their voices, while the early guests tucked into the buffet spread laid out at the marquee by the side of the cathedral sanctuary. At 7.30pm the Service of Thanksgiving started with a procession of church leaders making their way up to the altar, to the momentous congregational singing of “To God Be the Glory”. Dr Bobby Sng, President of The Bible Society of Singapore, welcomed everyone, encouraging all present to join together in a spirit of celebration, thanksgiving and intercession. Immediately after that, the Singapore Bible College Choir gave a heartwarming rendition of “We Thank You, Lord”. The sublime blend of voices was a moving experience, articulating in song the words of thanks that were in the hearts and minds of the congregation. The first Scripture passage from Genesis 11:1-8 was read by Lieutenant- Colonel David Bringans, Officer Commanding of the Salvation Army, Singapore. The reading was followed by two anthems from the combined choirs of Christ Methodist Church, filling the cathedral with rich tones of musical offerings to God. The Rev Tan Cheng Huat, the English Presbytery Moderator of the Presbyterian Church in Singapore, then read about the Mystery of the Incarnation from John 1:1- 18. After that the Ang Mo Kio Tamil Methodist Church Choir presented a Tamil song, accentuated with lively harmonies and rhythms. The Rev Sebastian Chua, Chairman of the Singapore Baptist Convention, made his way to the lectern to read the final Scripture passage from Acts 2:1-21 describing events on the Day of Pentecost. 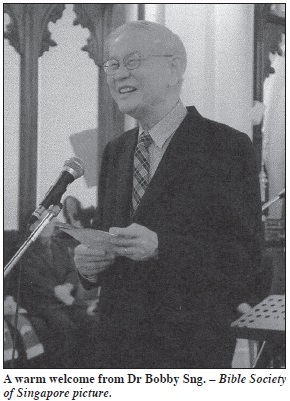 The congregation responded to the Scripture readings with the Bible Society Bicentennial Prayer, and the hymn “Wonderful Words of Life”, in preparation for the message shared by the Rt Rev Dr John Chew, Bishop of Singapore and President of the National Council of Churches of Singapore. Bishop Chew’s sermon, entitled “The Unchanging Word in the Changing World”, was a timely reminder for all present to remain true to God’s Word especially in the volatile and fast environment of today’s world. With his words still resonating in the hearts of the congregation after the sermon, the Voices of Praise choir delivered in Mandarin the song “In God We Trust”. As the service drew to a close, Mr Lim K Tham, General Secretary of The Bible Society of Singapore, thanked everyone for their attendance and for making the service deeply meaningful. 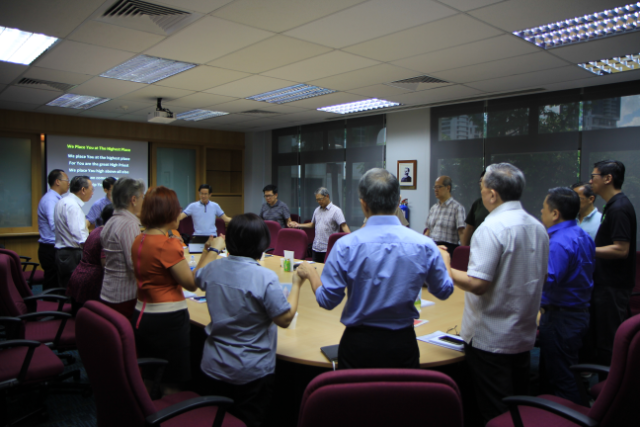 At the same time, the society launched the “Bible-on-Stamps” Series authored by Dr Sng. This stamp book collection highlights the life of Jesus, the Old Testament and the history of the church. Finally, the Rev Dr Patrick Lau, General Superintendent of the Assemblies of God, Singapore, gave the blessing. As guests slowly made their way out of the cathedral, many took the opportunity to greet friends. The evening was a portrayal of the varying colours and diversity among the Christian community in Singapore, yet it also spoke volumes about one and all coming together to give thanks and prayer for a mission that involves the entire church of Jesus Christ. For all who have supported the Bible cause, and to the many who attended this significant Service of Thanksgiving, The Bible Society of Singapore extends its warmest thanks and deepest appreciation. 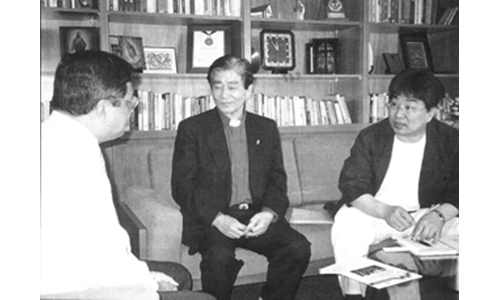 Leonard Tay is the Manager (Communications) of The Bible Society of Singapore. 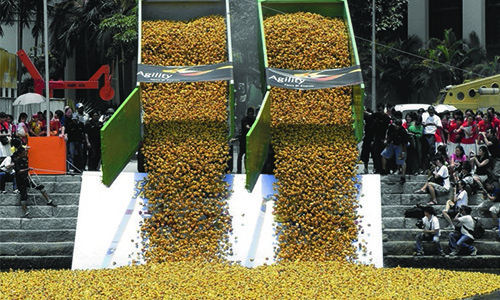 Some ducks – they bring in $850,000!